It all began in Dublin in 1983 when England’s Five Nations season ended in disaster (plus ça change) with a 25-15 defeat by Ireland leaving them languishing at the bottom of the table. That evening a group of victorious Irish fans presented a group of deflated English fans with a wooden spoon, a spoon that was then signed by the players of that 1983 Five Nations game. It became the prize in a golf day that raised funds for a new minibus for a special needs school. At the time, no one had any idea that a group of fans going to Ireland to watch some rugby would grow into a charity that, over the last 25 years, has distributed over £13.5million across 276 capital projects to help improve the lives of mentally, physically and socially disadvantaged children and young people in the UK and Ireland; not such a bad result after all. 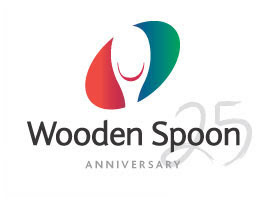 So, Happy 25th Anniversary to Wooden Spoon, a charity I'm happy and proud to support. Spoon plans to celebrate its quarter century milestone over a period of two years and the celebrations kick off this Saturday at 10.30am when the Wooden Spoon England Legends will take on an Irish Legends team at Richmond Rugby Club - a game which (given the form displayed by both England and Ireland last weekend)may well turn out to be somewhat more entertaining than the "other" match down the road at Twickenham later that afternoon. 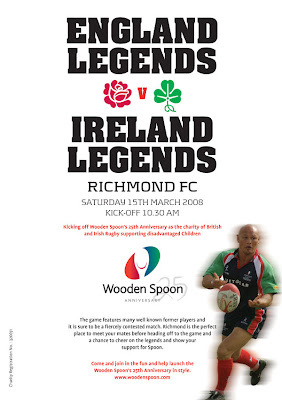 For more details on the game and for more information about Wooden Spoon please click here. Great Story, Flanker! I had always wondered about the origin of the term "Wooden Spoon". And what a great way to support a good cause and seem some legends of the game play! Nursedude, this story may be the origin of this charity, but the term "Wooden Spoon" is much older, see here. Thanks for the clarification, Peter.